TCi director Prabhu Pingali set out on a 4,000 km journey across four states to conduct interviews with farmers in more than 20 locations throughout India. Here are some of his reflections about a trip to Wardha, Maharashtra. As we were driving into a remote village in the hills of Melghat, a region of impoverished tribal populations in Eastern Maharashtra, a local development worker was bemoaning the fact that traditional foods were disappearing from local diets. He was complaining about the missing links in the food chain: foods that complement the calories provided by the staple cereals with essential micronutrients. He talked about the loss of traditional minor millets in the local food system, said to be high in micronutrients, and attributed much of this change to the easy availability of highly subsidized rice and wheat through government shops. We arrived at the village, which sat at the top of a hill, and drove the last 20 km up the hill on a narrow muddy track that is not traversable by cars for three months during the rainy season. We seemed to have caught the tail end of the accessibility period. 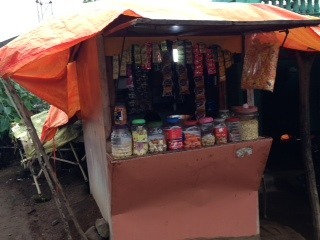 There were two small kiosks on the main street, selling shining packets of snack food, bread, soap and other consumer items. I noticed little kids buying packets of cheese balls and potato chips. Global diets had made their way to the hills of Melghat. A 70-year-old grandmother reflected on the changes in diets during her lifetime in the village. She talked about the time when sorghum rotis were the predominant food, but today young children refuse to eat them. They prefer wheat rotis or rice. She did not see any reason to go back. Her sons, in the meantime, switched from subsistence sorghum production to commercially lucrative cotton and soybean. They saw themselves as better off and did not see any particular reason for going back to the way it was. The group gathered under the tree where we were sitting nodded in affirmation. Like it or not, diets are changing in rural India as they are in urban areas. We as development practitioners have to figure out how to work with that. Projects promoting the return to traditional ways in diets, as in production systems, have generally failed. The rural poor aspire for a modern life - television commercials and movies provide appealing images of the life they could lead. How do we achieve our goal of reducing malnutrition in India while respecting the aspirations of the rural poor and their evolving food habits? There have been some promising advances in enhancing the micro-nutrient content of staple crops. High iron pearl millet (known as bajra in Hindi) has been developed at ICRISAT in collaboration with the global program HarvestPlus. The high iron variety has been developed through conventional breeding techniques and not through genetic modification. Private seed companies, such as Nirmal Seeds, are starting to promote the production of this variety in farmer fields. Large-scale feeding trials have shown that the variety does improve the iron status of children. The challenge now is one of promoting its use in small farm production systems, and its integration into rural household diets. To be successful in the promotion of biofortified bajra, one needs to work with the changing tastes and diet preferences of the rural poor. Promoting the consumption of micronutrient enhanced food among the urban middle class can have a direct influence on the tastes of the poor. Moreover, mainstreaming non-traditional foods in middle class diets leads to an overall boost in market demand that could be beneficial for small farm incomes. There are several examples of such mainstreaming of non-traditional foods into urban diets, quinoa being one highly visible example in the United States. In India, there have been recent attempts to popularize the consumption of unpolished dal, brown and red rice, and multi-grain atta (flour), which is a mixture of wheat, sorghum, millets and pulses. Brittania Company has also had some success in promoting high iron biscuits. Urban consumers and urban food systems provide an enormous opportunity for increasing the consumption of biofortified bajra and other high nutrition foods. Successful entry into the urban food system will also help reduce the prevalence of high levels of anemia among urban middle class women. Promoting the consumption of biofortified food through advertisements targeted towards urban consumers will also change rural attitudes towards their own traditional foods. This could be a great opportunity for the agri-food industry to promote healthy rural diets.